Having lofty aims is not a bad thing at all. The director of 24, Vikram Kumar, clearly did. He set out to create a Disney-style sci-fi film with elements like time-travel, a Stephen Hawking-ish villain and locations inspired by fairy tales. He also managed to incorporate most of those elements. But he then seemed to have remembered that he was making a Tamil film with a really big star in it, which meant he needed to incorporate a lot of other elements. And when you decide to incorporate all those elements, too, you have bitten off more than you can chew. 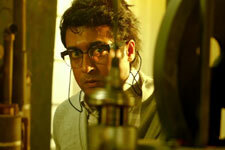 24 starts off with Siva Kumar (Suriya) making a watch that will allow him to travel through time. He is then attacked by his brother Atreya (Suriya again) in an attempt to get the watch, and is killed. Atreya fails to get the watch, however, and goes into a coma in the attempt. 26 years later, Siva Kumar's son Mani (Suriya, yet again) gets the watch, while Atreya comes out of his coma just then and starts another tussle for the watch. How Mani uses the watch and sets things right forms the remaining movie. The initial portions of 24 play out very well and pull you in. All the disparate tracks in the story come together admirably and conspire to put the watch in Mani's hands. Once he gets it and understands how it works, however, Vikram Kumar goes overboard. Sure, when a tool as great as a time machine falls into your hands, you will do some silly things initially - but when these go as far as helping India win a cricket match that it lost, you lose interest in the proceedings. Vikram then manages a rescue by setting up the interval with a stunning twist, and the scene immediately after is awe-inducing. The plot now gets quite interesting, but then the love story intrudes. It is stretched beyond tolerance, and Rahman delivering an absolute dud also contributes. Vikram manages to finally wrap things up on a high by turning the entire story on its head (and he shows off his intelligence here), but the intermediate portions have already left you cold. Also, certain cinematic liberties are way too far-fetched - that a guy who repairs watches can change the way a time machine works and enhance its powers multi-fold is way too difficult to believe. Overall, take the love story out of the equation, and 24 would've been much shorter and much more engaging. Performance-wise, if you notice the plot portion of this review, there are three characters that we name, and all three are played by Suriya. This is Suriya's film - while he hams in one role, he does wonderfully well in the other two, especially in that of Atreya. This is a broadstrokes performance that is more flamboyant than nuanced, and Suriya understands and delivers. Ajay gets a meaty role and does well, while the others including Saranya provide stellar support. The music, like we mentioned earlier, is a dud, with only Nee Valle being pleasant on the ears. The timing of the songs and the Tamil-to-Telugu translations of the lyrics don't help, either. The visual effects however are top-notch - Suriya has clearly spent amazing amounts of money, and the film is mounted and shot beautifully. Suriya needs to be praised for agreeing to produce and act in 24. We just wish he'd gone the whole hog and had the conviction to do away with the love story and stick to keeping this a taut thriller. Go watch 24 only if you don't mind the padding - an extra sweet love story sure to cause diabetes. fullhyd.com has 700,000+ monthly visits. Tell Hyderabad what you feel about 24 (Telugu)!